Near Field Communications or NFC is relatively new to our Windows Phones with the technology having enormous potential. With NFC Launchit, you can program NFC tags with a variety of actions to make life a little easier. All from your Windows Phone. You'll need a supply of unprogrammed NFC tags and with NFC Launchit you can program two types of actions based on System Apps and Popular Apps. If you only use your Bluetooth when in your car, program a NFC Tag to launch your Bluetooth and stick it to your car visor. The layout on NFC Launchit is rather direct. 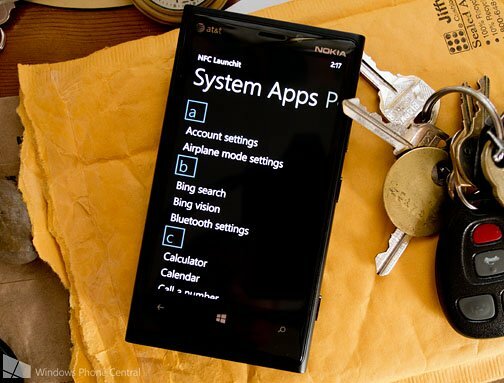 The System Apps page lists actions specific to your Windows Phone. They range from making a call, launching text messaging or even pull up directions to a specific address. The Popular Apps page basically gives you options to launch any installed app or game. To create the tag, just choose your action, fine tune it if necessary (e.g. find the number you want the tag to call), hold the unprogrammed tag close to the back of the phone and let the app do it's thing. If you need tags, NFC Launchit also includes a link to an Ebay sale for the tags (3 for $10). You can find NFC tags from other sources as well such as keychain tags here at Amazon.com. 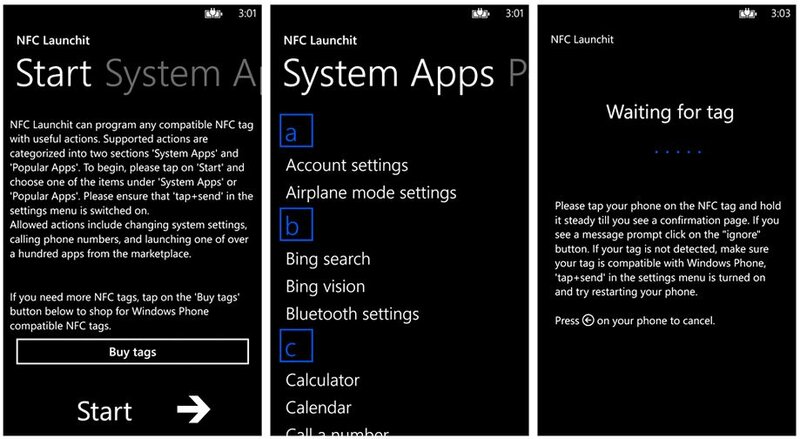 NFC Launchit is a neat app for your Windows Phone to help you expand the potential NFC has. You can program a NFC tag to launch directions home to place in your teenager's car, program one for Airplane mode that you can place on your carry on luggage, or just program one to launch a favorite app. You will need an NFC compatible Windows Phone and unprogammed NFC tags for NFC Launchit to work. It's a free Windows Phone app and you can find NFC Launchit here at the Windows Phone Store.